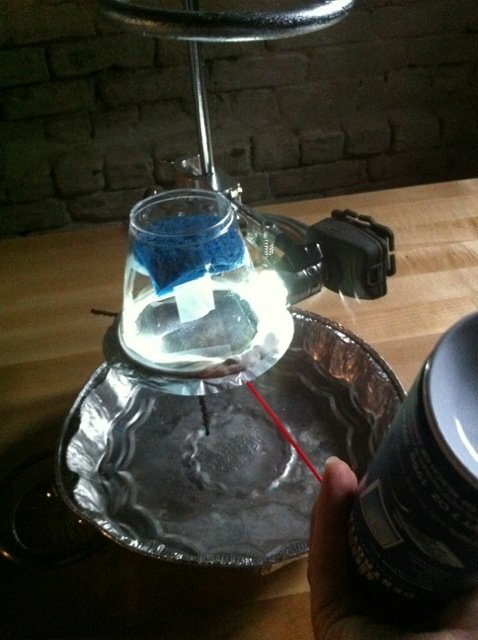 Foil tray, plastic tumbler, and rubbing alcohol make for a simple cloud chamber, without any dry ice. In about 10 minutes, using stuff you probably already have lying around your house, you can watch atomic nuclei and elementary particles for yourself using a diffusion cloud chamber—a rudimentary particle detector. There are lots of websites and YouTube videos giving step-by-step instructions to build such a chamber, but all require some component that’s hard to come by, such as dry ice or a high-voltage power source. I’ve gotten around that by merging a cooling technique devised by Canadian high-school student Olivia Donovan with the chamber designed by Australian particle physicist and science communicator Suzie Sheehy. It’s not super-great as a cloud chamber, but it definitely reveals particles whizzing through it. The real innovation here is the air duster. The difluoroethane it releases is cold—cold enough to supercool alcohol vapor, which is what you need for a cloud chamber. The supercooled vapor will condense along the paths of ionizing particles like a tiny contrail. The one thing you probably don’t readily have is a source of ionizing particles, but you’d be surprised how many household items are mildly radioactive, and scientific suppliers sell test sources. I bought a chunk of uranium ore from United Nuclear. (If nothing else, receiving a box from a company called United Nuclear will impress your friends.) Even if you don’t have a source, you can use the cloud chamber to see cosmic rays—energetic particles from outer space. Cut a piece of sponge a few inches square, soak it in rubbing alcohol, and wedge it into the bottom of a clear plastic cup, holding it in place with tape. Mount your radioactive source, if you have one, to the inside of the cup just below the rim. I found it important to mount the source to the cup rather than just lay it on the bottom of the chamber; that way, you slow down how fast the source gets coated with alcohol. Cut a circle of black construction paper to match the rim of the cup. This will provide a dark backdrop to view particle tracks. Flatten the cupcake foil, center the paper circle on it, and tape it down. Press blu-tack along the cup rim. This will be the air seal between the cup and foil. Press the cupcake foil to the rim. The paper circle should be inside the cup. Smush the blu-tack into any gaps so that you have a decent air seal. 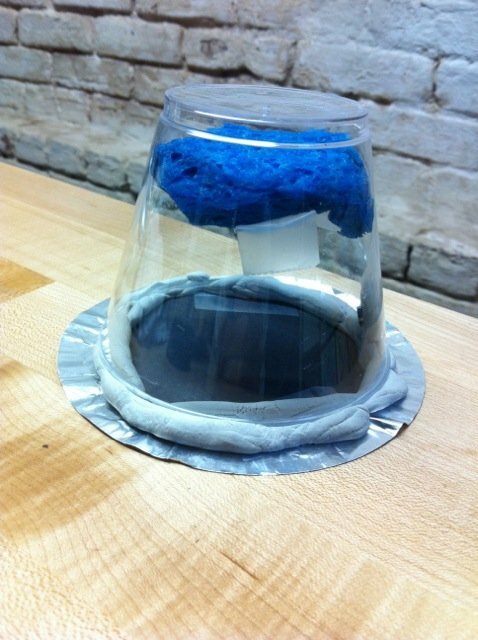 Place your chamber above the foil tray to catch difluoroethane released from the spray can. I mounted the cup on a chemistry lab stand, but you can just hold it with your hand (which is better in some ways, because your hand warms the sponge, increasing alcohol evaporation). Shine the flashlight into the chamber. I got the best results when the flashlight was nearly horizontal and touching the cup to minimize reflection off the plastic. To operate the chamber, turn off the room lights, hold the air sprayer upside-down, and spray the foil for a couple of seconds. Repeat every 10 seconds or so to keep the foil cold. A sign that it’s cold enough will be that ice crystals form on the outside of the foil. Inside the cup, a mist of alcohol droplets forms almost immediately along the bottom, within a centimeter of the construction paper. If you have a radioactive source, you should start to see tracks radiating from it. If not, you’ll see a cosmic ray streak across the bottom of the chamber every 20 seconds or so. If you can’t see anything, change the illumination angle. I got significantly better results by replacing the foil and paper with a square of aluminum sheet metal covered in black electrical tape. The spray cans are exhausted quickly. I bought a four-pack of them. To prolong the particle fireworks show, buy some dry ice—my local ice cream store sells it—and lay the chamber on a block of it. Introducing a whole new breed of number, the p-adics.